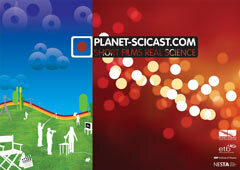 OK, you’ve watched some films, maybe you’ve read some of the blurb here about what we’re trying to do with SciCast. Perhaps you’ve got an idea for a film. But how do you start? That’s what Film School is for. There’s a wealth of information there, and it’s worth exploring. Dive in! 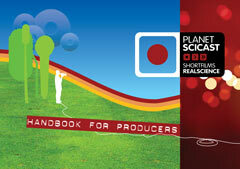 In early 2008 we produced a terribly pretty printed handbook about all things SciCast. They’re sadly all gone now, but the content has been revamped and updated and lives on at this site as Film School. For those who prefer everything in one place, you can download the booklet as a PDF. However, do see the updated information on this site about Licensing and Using Other Peoples’ Stuff — they’re much clearer than the handbook. Along with the Handbook, we also produced an A3 poster. Again, they’re all gone, but they’re still rather dashing, and you can print your own by downloading this PDF (860Kb). 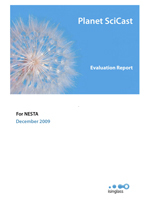 After the second SciCast Awards in 2009, we commissioned this evaluation report from Isinglass Consultancy. We’d like to make it available to a wider audience, so here it is: download the PDF. Something else we can offer? Drop us a line: theteam@planet-scicast.org.uk. Thanks!